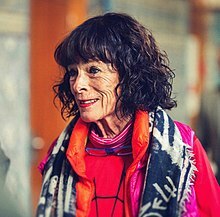 Geraldine Leigh Chaplin (born July 31, 1944) is a prolific actress of English, French, and Spanish language films, the fourth child of Charlie Chaplin, the first of eight with fourth wife Oona O'Neill. Chaplin has appeared in a wide variety of critically recognised Spanish and French films. She starred in Les Uns et les Autres (1981), Life Is a Bed of Roses (1983) and the Jacques Rivette experimental film Love on the Ground (1984).